Update 10 June 2018: Toni Hassan in Fairfax with quotes from Director Nelson and Honest History spokesperson. The Minister for Veterans’ Affairs, Darren Chester, has announced an investigation into how the Australian War Memorial raises funds from the private sector. ‘I will be asking the director for a detailed briefing on all fundraising activities they undertake and how the monies raised are spent’, the Minister said. This follows recent reporting of the Memorial’s donations from the Chinese-Australian businessman, Dr Chau Chak Wing. Dr Chau was named in Parliament recently by Andrew Hastie MP for matters largely unrelated to Dr Chau’s links to the Memorial. Mr Hastie did not mention these links, but they have been well-covered in recent days by the mainstream media. Dr Chau’s assistance to the War Memorial was mentioned briefly in Fairfax-ABC reporting 12 months ago and Honest History has been following the matter since then. (Use our Search engine with the search term ‘Chau’.) The War Memorial has been unhelpful to this research and took a similar stonewalling approach to inquiries from author Clive Hamilton for his book Silent Invasion. One big advance from the recent reporting by Sally Whyte and others from Fairfax has been putting a figure on Dr Chau’s donations to the Memorial – $560 000, a relatively modest figure compared with his generosity to universities and political parties, but enough to earn Dr Chau a War Memorial Fellowship. Of this amount, $500 000 was for the Memorial’s media and education centre and the rest for other purposes, including a well-meant but clangingly amateurish booklet on Chinese-Australian servicemen. The other advance has been the public justifications from the Memorial’s Director, Dr Brendan Nelson, for its private sector fundraising. As the Director told Hamish MacDonald from the ABC, the Memorial has ‘actively gone seeking’ donors like Dr Chau. The current parliamentary inquiry into national cultural institutions is bound to ask questions of Dr Nelson and his colleagues on these practices. Meanwhile, it is to be hoped that the Memorial’s response to the Minister is made public. Eagerness to tap corporate funding sources should be accompanied by best practice in ethics and transparency. National institutions should each develop and publish a code of practice for public and corporate donations to the institution. This would clarify what donors may receive in terms of recognition and other benefits in return for their contributions. 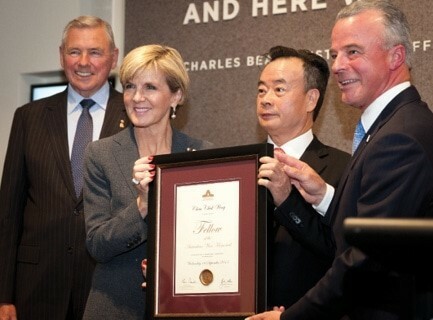 awarded a Fellowship (like Dr Chau’s) to the Chief Executive Officer of Boeing (AWM Annual Report 2015-16, p. 63), one of the world’s largest manufacturers of arms, and a company which recently rated badly in a Transparency International (TI) corruption survey (scroll down to ‘Update 10 April’, near the TI logo). And then there is Dr Chau, the trigger for the Minister’s current briefing request. Of course, not all of these matters could have been foreseen at the time the money began to flow to the Memorial or the connection was made by it. Nevertheless, a proper due diligence regime, alongside active funds-seeking, would do much to protect the Memorial’s reputation. This is an unhelpful change on the Memorial’s part but even its previous practice was insufficiently transparent – and for no obvious reason. In the Chau Chak Wing case, the universities and political parties that Dr Chau has given to have disclosed the value of his gifts. Only the Memorial has been coy – until now. The Minister is right to query this institution, whose ‘sacred’ status has too often insulated it from accountability. * David Stephens is secretary of the Honest History coalition, editor of its website (honesthistory.net.au) and co-editor of The Honest History Book (2017).